KK and the City: Clairvoyant? Two nights ago, I had an out-of-character dream. It was so not me because 1.) I remember it vividly and I never remember my dreams and 2.) It's not anything I expect or want or could handle anytime soon. I dreamt I got engaged and had a massive engagement ring. And as I sat in class, I was staring at it, and it was making me happy to just feel loved and have something sparkly on my finger as I was getting yelled at by a mean old professor. Because I was staring at this ring so much, it's kind of burned into my mind. It was a thin band with diamonds, that split kind of like a Y and came up to hold a massive square diamond, surrounded by little diamonds. I woke up a little weirded out - because WO life committments? No time soon, k thanks. But then yesterday, the Bruins raised the banner for winning the 2011 Stanley Cup. I - luckily - snagged a pic with Lord Stanley's Cup, and as I idly stood around like a bump on the log in the excitement, a guy dressed in all black with curly hair came over. He was a Bruins photographer, and quietly asked if I wanted to see the championship ring. UM, YEAH? 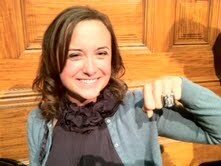 He snapped a few fantastic pics of me wearing the Bruins ring... and lo and behold? Looks as much like my dream "engagement" ring as a sports ring could. And now for a small fee, I will tell you oddly specific, bizarre and inconsequential future happenings in your life.